Providing a refuge from the demands of the day, your bedroom furniture collection exudes comfort and convenience. The Amish Edinburg Nightstand is an essential piece for that relaxing scene, offering just the right amount of surface space and storage next to your bed. 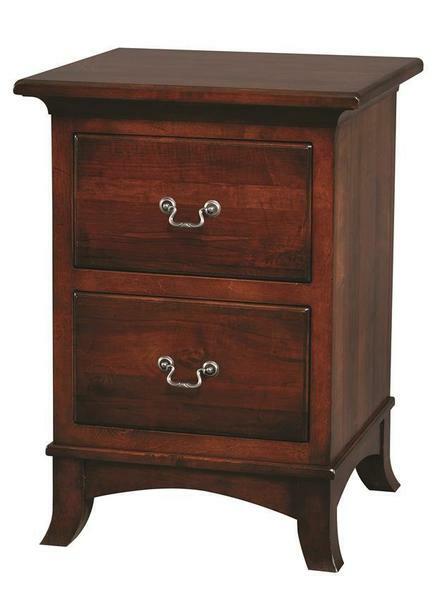 The style of the Edinburg Nightstand is graceful and elegant, with feet that are slightly curved to perfection. The Edinburg has room for your bedside lamp for some relaxing read time, your phone, and provides plenty of drawer space for your favorite reading material. The perfect combination of bedside table and storage, this Amish nightstand is truly a bedroom essential. Take a look at our Bedroom Benches to review some stylish seating options for your bedroom furniture collection. These bedroom nightstands are handcrafted with precision and the ultimate skill by our talented Amish woodworkers. Contact us today, toll-free at 866-272-6773 to speak with an Amish Furniture Specialist.